Look closely at the above picture. Take your time, I’ll wait. Now, try to figure out what planet these alien creatures below are from. If you guessed right here on good old Mother Earth, you are correct. 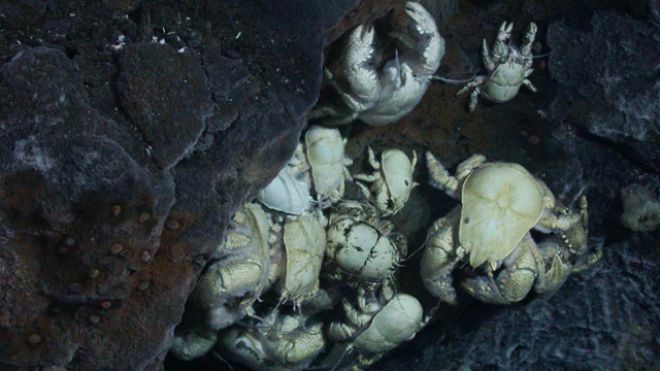 Both of these weird-looking creatures are called “Yeti Crabs” and are found in underwater vents in the Antarctic. Outer space isn’t the only place we will find “alien” lifeforms. If you really want to see something out of this world, pack a Parka and take a trip to the Antarctic. There you will find a myriad of undersea life that boggles the mind and in some cases makes the stomach flip. The American’s, Russian’s and British have been, for a few years now, racing to see which country would find life in some of the hidden lakes in the Antarctic. I know what you’re thinking; the same thing I was. Wouldn’t all the water in the frozen south be, well, frozen? The answer is, No. It turns out there are pockets of freshwater lakes underneath the ice. And scientists are on the hunt for lifeforms which could exist there. So what does this mean for space exploration? I’m so glad you asked. Finding life underneath the ice gives us a possible glimpse into what could exist on frozen planets like Neptune, some of its surrounding moons and Uranus. While these planets are Gas Giants, they are also composed of ices. The liquid portion of Neptune is composed of water, ammonia and methane ices (I wouldn’t recommend drinking it). However, scientists believe that there is a possibility that the ices are not completely solid down to the core of the planet (which is made of rock and ice). If this is the case, just like in our Antarctic, there is the possibility of some form of life. A proposed mission to study Neptune and one of its moons, Triton is set to launch in 2015. The large spaceship, which if the economy allows, is supposed to carry a lander and two probes and will take about 12 years to reach the icy gas giant. If the above pictures are any indication, we may find that it is probable for life to exist on a frozen planet. It’s also through looking at the myriad lifeforms here on Earth, that scientists are able to postulate hypothesis about what could evolve on planets and moons in our Solar System and others. Many of the aliens that I create in my novels are actually based on animals on our planet. For their customs, I use combinations of different ancient cultures. I guess you can say, that the research I do for my aliens is the same way scientists currently speculate about what, or who, could be out there. The potential for life on others planets seems promising. What wonderful discoveries await us, we can only guess.